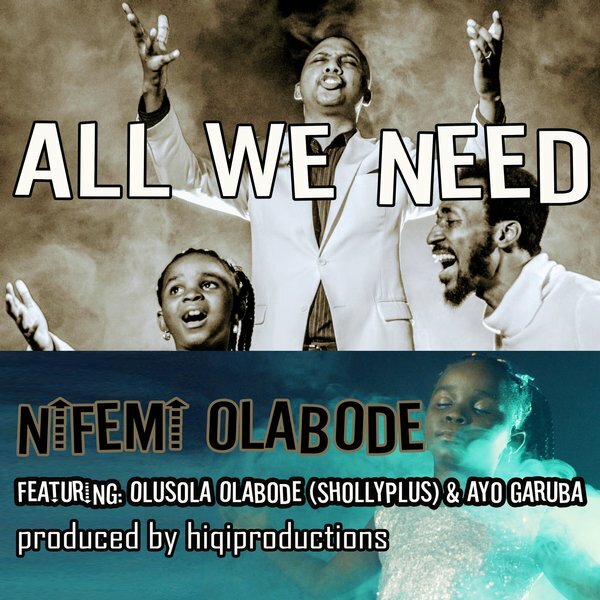 All We Need By Nifemi Ft. Shollyplus + Ayo Garuba. Olusola Olabode fondly called Sholly+ read “Shollyplus” derived from Sola plus the invinsible God (shollyplusthealmighty). Born in Lagos into the family of Mr. & late Mrs. Olabode of Iyewa South in Ogun State, loves music and started singing from when he was a youngster. Shollyplus was at various times the man at the rudder of several choirs and music groups between1998 and 2005. Which include but not limited to the Fellowship of Christian Students (FCS) and the Flamz of Love at Federal Polytechnic Bida, Niger State where he graduated with a top grade in Electrical Electronics Engineering, also with National Christian Corpers’ Fellowship Choir (NCCF) and the Grounded In Christ (G.I.C). As a music minister, he has ministered in most recent concerts and high profile events with other likes of gospel artiste. He is currently the coordinator of the Bible Believers’ Church Ministries (BBCM) Inc., Headquarters Power choir in Surulere, Lagos. A naturally inspired song writer and gospel minister, unique in his own way, draws his strength & inspiration from the Almighty and loves to make people happy. He is married to the charming Ngozi and they are blessed with Oluwanifemi, Titilayo & Oyinkansolami. He believes only God’s grace and favor can make one’s gifts unique knowing that gifts without character ends up in disaster. So, I encourage all gospel singers to be focused, passionate, loving and truthful in their dealings, not living in double-standards that make people run away from the faith and, yes of course, this message is not for them alone. It is also for you whose reading. It pays to humbly serve and to do good, even though it sometimes comes with pains, disappointments and trials of all kind. All we can do is to look up unto Jesus, the author and finisher of our faith.